Posted on March 2, 2011 by Jill B.
Gum, pens, receipts, dollar bills. It used to be inconsequential albeit messy items left to get soaked, tossed and heat-blasted in your laundry pockets. Now, those contents and where you leave them could actually do even greater harm. 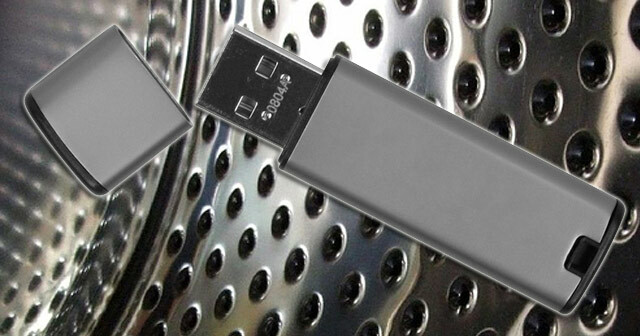 At more than 500 laundromats and dry cleaners in the UK, 17,000 USB flash drives were left behind between December 2010 and January 2011. According to the study’s researchers at Credant Technologies, that’s a 400 percent increase in lost devices compared to the year before. This research speaks volumes not only about consumers, but the potential consequences of leaving your digital footprints behind in the last place you look. So what went wrong? As Credant’s VP of marketing puts it—“a growth in IT consumerization.” USB drives are cheaper than ever and therefore accessible to every consumer. Moreover, you probably can’t think of one person you know that doesn’t carry at least one electronic device in their pocket or purse, (except for maybe a 90 year-old grandmother). Consequently, the portability of flash drives and other digital devices is not only our greatest asset in staying connected professionally and personally, but also a source of weakness. Since USB devices can go anywhere, they can get lost anywhere. When this happens, there are fewer chances of retrieving them. The fallout comes from what gets left behind. It’s no big deal if you leave a few old classwork assignments on a missing flash drive, but it’s a different matter leaving sensitive records entrusted to users by their employers on a USB stick. It’s the kind of serious error and data breach that could bring a business to its knees. – More education. Organizations need to take responsibility for their portable digital information. While it may seem like a no-brainer to tell people, “Be careful with your flash drive,” employees or students may be more inclined to take it to heart if they understand the ripple effect of what could happen if one turns up missing. Make sure that individuals know what’s at stake by fully understanding the unassuming power of a flash drive’s data. – A greater demand for user-friendly encrypted flash drives. An employer may give out a government standard, 256-bit AES encrypted flash drive with the works for sensitive data. However, these devices are not something that even a user with a password can simply plug and play. They are like a complex program that needs to be skillfully taught. An organization may not have the time, patience or resources to really learn how to use it. As a result, one may turn to a simple, unprotected flash drive. If data encryption is made simpler by manufacturers for the user and can still ward off hackers, it could prevent disastrous data loss. – Check your pockets! It’s something your parents always nagged you about. While it’s the simplest, most face-palm worthy solution, it’s also the most logical and economical. USB flash drives are here to stay, as they should. They are an amazing accessory to our digital lives—we just have to learn how to harness their storage potential. Thoughts? What do you think is the best way to prevent data breaches from lost flash drives? This entry was posted in Articles, Flash Drive, USB Flash Drives and tagged Credant Technologies, encrypted flash drives, Flash Drive Lost, Rising Trend in Lost USB Flash Drives, USB devices, USB Flash Drive Lost UK Study, USB flash drives, USB rising trend. Bookmark the permalink.